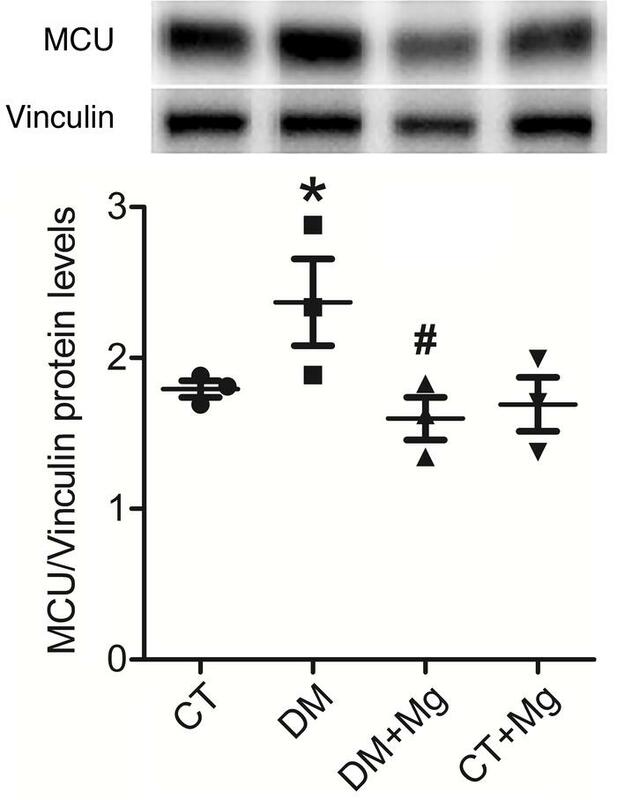 In DM mice, the protein level of MCU was elevated compared with control mice. Mg supplementation reversed the change. Heart tissues from 3 mice were used to collect protein samples and perform Western blot for each group. One-way ANOVA with Bonferroni post hoc test and 2-tailed Student’s t test were used; *P < 0.01 vs. control and #P < 0.05 vs. DM. CT, control mice; CT+Mg, control mice fed with normal diet and Mg in drinking water; DM, mice fed with high-fat diet; DM+Mg, mice fed with high-fat diet and Mg in drinking water. MCU, mitochondrial Ca2+ uniporter.